The real estate market in Byron GA continues to defy odds with plenty of sales, despite a severe shortage of available inventory. This past month saw the fourth highest number of sales (26) in the last year. With only 1+ month of homes for buyers and investors to choose from, if new listed properties are not made available soon, consumers will skip this market and begin their home search in other parts of Houston County GA. If you are thinking about putting your home on the market, it is definitely a good time to get it seen by consumers. Real estate agents in Byron GA are showing every home available and many of these properties are making their way to the closing table. If you are unsure about entering the real estate market in Byron GA, hopefully this market analysis will change your mind. It is definitely time to get your home listed! So, what happened in September in the Byron real estate market? This report outlines the current status and details the short-term outlook for this market too. If you have questions about real estate in Byron GA or want help buying or selling a home in this market, contact me and let my market expertise work for you. As of this writing, there are a total of 33 houses for sale in Byron GA. The highest priced listing in this market is currently available at $364,999 and the lowest is only $79,900. Square footage of available properties ranges from 1,329 feet up to 3,769. Also, there are homes available in numerous price points to meet the needs of all real estate buyers. Consumers who are looking for a fixer-upper may have to wait awhile as there is only 1 distressed property currently available in the Byron real estate market. Unfortunately for sellers, there has been a slight increase in foreclosure and/or short sale homes in the past quarter which can affect appraisals and future sales prices. The highest priced home for sale in Byron is a home located at 15 Courtney Drive. Available for $364,900, this 3.6K+ square foot home has 5 bedrooms, 4 bathrooms, and a host of amenities worth checking out. Currently, there are just 23 Byron homes that are pending sale. This represents an increase of 6 properties over the previous month. Of these 23 houses, only 1 property is distressed. This market has finally started showing signs that it may be getting ready for the winter solace. Time will tell if that holds true. With conditions squarely in their favor, smart sellers are ensuring their home is ready for buyer views, updated as needed, and priced according to the current market conditions. While they have the upper hand in this sellers market (1+ months of inventory), properties that are not in good shape will sit on this market. There was a total of 26 home sales in Byron GA during the month of September 2017. This represents the 4th highest number of monthly sales in the past year (the annual average this past year is 22 sales). The average sale price for these homes was $125K+ and they took an average of 49 days to sell! The 12-month average for both of these categories is $152K+ and 65 days. Clearly, consumers found properties in the lower price points to their liking this past month. The average days on the market was steady this past month and is a reminder to sellers to ensure they continue to market price their home if they want buyers to take interest. The sales price to list price ratio in September was excellent at 99.79%, which was much higher than the 12-month average of 98.16%. When market priced, sellers are reaping the rewards. The most expensive sale in Byron real estate during September 2017 sold for $248,6320. The lowest priced sale was $21,500. In addition, 7 of the sales this past month were distressed homes which could have a slight impact on appraisal values in the affected neighborhoods for the remainder of the year. What Can Byron GA Residents Expect Regarding Real Estate In The Coming Months? You can expect plenty of competition when you are ready to make an offer on a Byron GA home. This could mean a bidding war if you are not ready to write an offer as soon as you decide the property is the home you want. Just remember, any delay could cost you the home as plenty of other buyers are also out looking! The amount of inventory and low pending sales will be worth monitoring for the next few months to determine if this is a trend or just an anomaly. Time will tell if a host of fresh inventory hits the market and if buyers continue to find homes to their liking in the Byron real estate market. 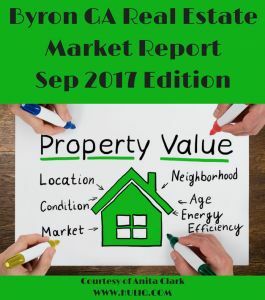 This Byron GA real estate market report for September 2017 was provided by Anita Clark. Anita is a licensed residential real estate agent in Byron GA with Coldwell Banker SSK, Realtors. You can find Anita on numerous social media networks or via her Byron Real Estate Blog. She is an active online real estate marketer who loves helping residential real estate consumers in Houston County GA.